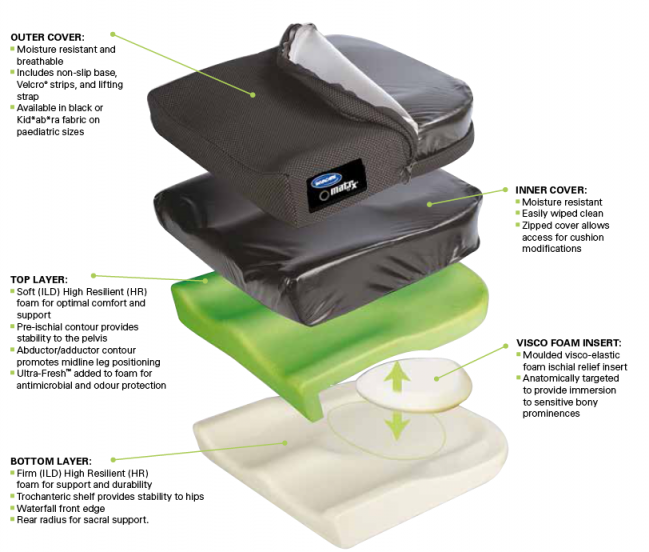 Matrx-VI Heavy Duty Cushion For Stability And Comfort. The Matrx-VI Heavy Duty Cushion is designed to provide skin protection and positioning for individuals at high or very high risk of skin breakdown. The unique three part foam construction targets skin protection to where it is needed most, and features improved stability, support and comfort. Outer cover - Moisture resistant and breathable. Includes slip resistant base, hook and loop fasteners, lifting strap. Top layer - Soft (ILD) High Resilient (HR) foam for optimal comfort and support. Pre-ischial contour provides stability to pelvis. Abductor/adductor contour promotes midline leg positioning. Made with Ultra-Fresh™ for antibacterial and odor protection. Bottom layer - Firm (ILD) High Resilient (HR) foam for support and durability. Trochanteric shelf provides stability to hips. Waterfall front edge. Rear radius for sacral support. Drop Base - Includes built-in drop base, drop hooks, Dura Clip fasteners. Allows adjustment of seat angle. Pleased with my purchase and will be ordering items from Active Mobility again.